Robert A. Heinlein remains one of my favorite authors. Unlike Ray Bradbury, who often may be read for an assignment in an English class, Heinlein might be somewhat lesser known to those not already familiar with science fiction. 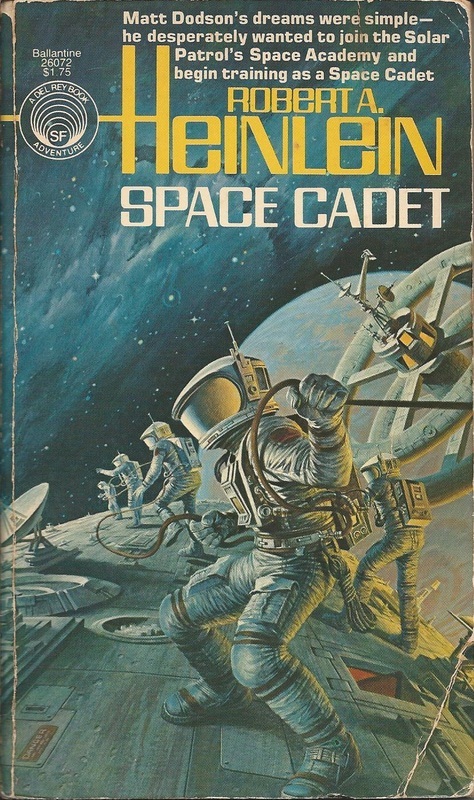 For myself, though, since the time that I first read Space Cadet at age 11 or 12, I have returned to Heinlein again and again. I read the book pictured at right probably 8 times when I was a kid. Later I read most, if not all, of Heinlein’s “juvenile” novels of the 1940s and 1950s aloud to my children. I still revisit Heinlein for entertainment and enlightenment, and as a critic I have written about several topics that happened to have caught my attention. Below is a list of my Heinlein criticism. Quite a bit of it is available in the online literary research databases to which many school libraries subscribe, but I also have provided links to other full-text sources when possible. Him Afraid’: Rebellion in the Fiction of Robert A. Heinlein.” Critical Insights: Rebellion. ​ Critical Insights Series. Ed. Robert C. Evans. Ispwich, MA: Salem, 2017. 175-90. Fredericks. Critical Insights Series. Ispwich, MA: Salem, 2017. 73-87. ​“Stranger in a Strange Land—Robert A. Heinlein.” Recommended Reading: 600 Classics Reviewed. Ispwich, MA: Salem, 2015. 306-307. “On Robert A. Heinlein.” 3-17. A Comedy of Justice.” 70-85. “ ‘Locked in Somewhere Safe’: Robert A. Heinlein and the Bomb Shelter.” 183-98. “Chronology of Robert A. Heinlein’s Life.” 245-50. “Works by Robert A. Heinlein.” 251-56.
Review 309 (Summer 2014): 39-41. Available online here. (Winter 2004): 388-407. First page preview here. Extrapolation 44 (Summer 2003): 169-200. Available online here and here. “From Free Love to the Free-Fire Zone: Heinlein’s Mars, 1939-1987.” Extrapolation 42 (Summer 2001): 137-49. Listed in Major Authors and Illustrators for Children and Young Adults, 2nd ed. Detroit: Gale, 2002. “[Time in] Heinlein’s Have Space Suit—Will Travel.” The Explicator 59 (Spring 2001): 144-47. Available online here. (Spring 1999): 53-70. Available online here, here, and here. Westfahl. Westport, CT: Greenwood, 2005. 360. Listed in “Starship Troopers.” Wikipedia.org (“External Links”). URL: http://en.wikipedia.org/wiki/Starship_Troopers. “Heinlein’s Inhabited Solar System, 1940-1952.” Science-Fiction Studies 23 (July 1996): 245-52. Rpt. in Children’s Literature Review 75. Ed. Rebecca A. Blanchard. Detroit: Gale, 2002. 71-76. Rpt. in Short Story Criticism 55. Detroit: Gale, 2003. 235-40.